The Acrolinx sidebar uses gradients of transparency and opacity to display some features. On computers that have a certain configuration, a Windows bug prevents the Internet Explorer Web control. This issue only happens on Windows Eclipse installations with a language setting that uses a non-English number format system. For example, languages which use a comma "," instead of a dot "." for the decimal position as in 3,143 instead of 3.143. The sidebar recognizes if your operating system has this problem and shows the following message. Some Sidebar features have failed to load. 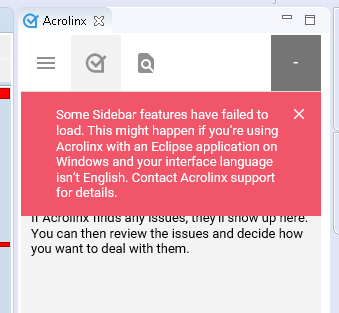 This might happen if you’re using Acrolinx with an Eclipse application on Windows and your interface language isn’t English. Contact Acrolinx support for details. On Windows Eclipse, not all images appear in the sidebar. Three dots don't appear on sidebar cards. 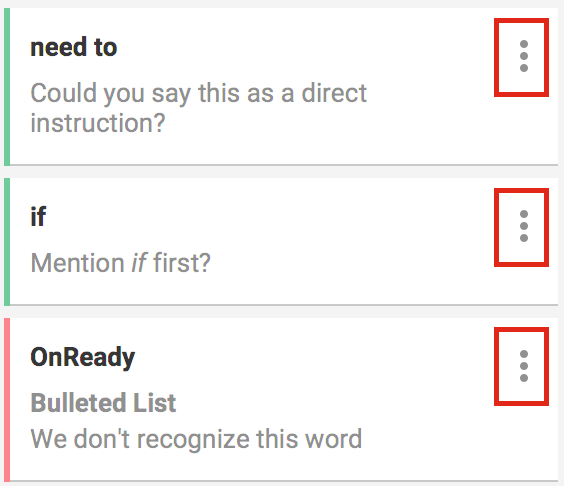 On Findability tab, icons for Target Keywords section and three dots for the sort menu do not appear. 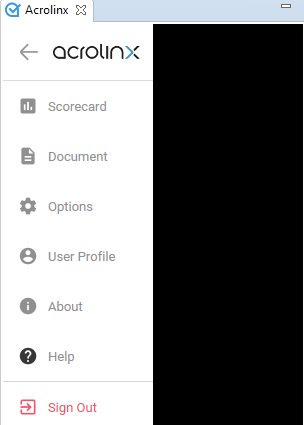 If you open the slide-out menu, the sidebar is black. The following screenshots show the affected images in the sidebar. On the Findability tab, the Target Keywords section image will not be visible. You can continue to work with this sidebar but it doesn't look very nice and you won't have access to all the features. You can switch your language setting to English.